cubaNew elements including digital screens and a band with some 100 members of musical groups were seen during the May Day parade in Cuba’s capital. Hundreds of thousands of Cubans assembled at the Revolution Square in Havana to witness the celebrations. There were also people carrying blue, white and red, as the digital screens displayed images and slogans supporting the construction in this country of a prosperous and sustainable development. This year the main slogan was “For Cuba: Unity and Commitment”. Cuban educators were the first to march in recognition to their work during the Literacy Campaign, on occasion of its 55th anniversary. The Chinese trumpet, a traditional instrument in Cuban conga, also set the pace of the march. 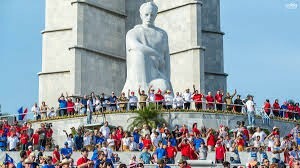 Participants waved to salute Cuban President Raul Castro and other government officials accompanying him at the tribune near the statue of National Hero Jose Marti.